The New York Times did it to me again, like an old boyfriend that you keep going back to, thinking it will be different, that he’s changed and it’s great for a few days but then he reverts back to his smarmy ways and once again, after you swore up and down and every which way that you’d never let it happen again, he breaks your heart. It was the last straw with Nigella espousing all things virtuous in a brown rice and seaweed salad however I was lured back with R.W. Apple's beautiful prose. But now this bastion of journalism has jumped on the Leek Broth Bandwagon and is headed west at full tilt with not one but two articles a few days apart! People, people, people…PLEASE! Leek broth, small portions, water, and walking. Hello?! Granted, I’m sure her vignettes are an enjoyable read but 4 weeks on the New York Times Best Seller List and two New York Times reviews?! Have we completely lost our natural minds? I guess it is no wonder that the other book in the top 5 is the South Beach Diet book which has been on the list for 91 weeks!?! I must give Ms. Guiliano credit as she is one smart cookie—pun intended. From a business perspective, her book is brilliant. She has absolutely nailed the American weight obsession and mad desire for instant results and y’all just played right into her champagne-popping hands. Is it no coincidence that her book is not being translated into French nor is being marketing here in France? In a twist of cruel irony, the Veuve Cliquot corporate web site press release headline reads: “Americans Devour "French Women Don't Get Fat" by Mireille Guiliano”. Even her company is mocking the “fat over-eating Americans”! Am I the only one that finds this whole thing patronizing? One of the NY Times fluff pieces, er I mean articles, claims that American are “secretly jealous of their fashion style” and “have an inferiority complex” and “…French women really don't get fat.” Well I’ve been here almost a year and I can tell you I’ve seen my share of “healthy” French women and the “Glamour DON'T” team could fill a years worth of magazines if they rode my bus just one morning. Now I’ve heard all the statistics on obesity in America so spare me the nasty emails as such generalizations just fan the flames of our already weight-fixated culture that drives 10 year olds to anorexia. Yes, it’s true that portions are smaller here. Yes, it’s true that people walk everywhere in Paris (not true outside of Paris) however Paris is a small city and public transportation systems here are so phenomenal that having a car is an annoyance or a luxury rather than a necessity. Yes, it's true they take the stairs but that's because most old building don't have elevators and are no more than 6 stories high. Yes, it’s true that the French take time to enjoy their meals and few, comparatively speaking, eat on the run but can you sum up an entire culture based on thousands and thousands of years of history in a little over 200 pages with a few recipes thrown in for good measure? Mme. Guiliano suggests we start incorporating these “subtle” changes into our lives yet these changes are anything but subtle as the cultures are so diametrically opposed. Claims that French women “dress to take out the garbage” are so ridiculous I won’t even comment. One of my favorite suggestions is “don’t rush”. Obviously Mme. Guiliano isn’t familiar with the hi-tech, dot com, business consulting, or legal profession's 80-hour week reality or the investment banking 24 hours/365 days on-call, on a plane twice a week lifestyle. Not surprising considering she hails from a country where maximum 35 hour work weeks and minimum 6 weeks of vacation are The Law! What she is asking us to do is to change an engrained culture that is founded on manifest destiny, entrepreneurism, be anything you want to be, work hard play hard, party like a rockstar, burn the candle at both ends and a get rich quick mentality. In other words, the American lifestyle is revved at about 8,000 rpms and is so irrational that it leaves no room for the rational to creep in and impart a little leisure or perhaps more succintly, we are one end of the pendulum swing and the French culture, the other end. She suggests that we walk to the market and stop to smell the fresh herbs. Can you see it: “I’m sorry I’m late for the meeting Mr. Gates, but I stopped to buy fresh heirloom tomoatoes at Pike's Place on my way work. By the way, can we talk about cutting back my time in the office so I can walk home at night?” That would go over like the proverbial lead balloon and said person would be catapulted to the unemployment office. Our culture is steeped with rush, now, get it, make it, launch it, fire drills, I need it yesterday, type A, bigger, more, better, faster, newer. The French culture is ripe with no worries, tomorrow, no rush, shrug, ppfffff, later, c’est la vie and the reasons for these would take volumes to ascertain and decades to impart. I have been able to incorporate some of these “subtle” changes into my lifestyle only because I LIVE here and I am immersed in French culture. It wasn't a conscious effort, it was a subconsious assimilation into French life. I don't have a car so I walk or take the subway. I sit down and eat with my roommates whenever we are both here. When I first arrived, my roommate Pierre couldn't believe that I would eat standing at the counter in the kitchen and quickly put an end to that habit. I shop every few days for fruit and vegetables and I buy a fresh baguette every other evening on the way home but... the bakery is two doors down on the corner and the farmer's market is across the street 3 times a week. This society is set up to accomodate such a lifestyle whereas the US isn't. Perhaps only in New York City could this conceiveably work and with the exception of New York City, Americans drive everywhere. There is a fast food drive through on just about every other block. We're hungry, we're late for a meeting, the kids are screaming, we want to eat, we don't want to wait, we want it now. McDonalds has no fear of becoming a going concern any time soon. Everything Mme. Guiliano champions in her book is common sense, things we’ve already heard and know all too well. Walking, water, small portions, fresh fruits and vegetables, don’t rush, take time to eat, take the stairs—really nothing momentous, earth-shattering, revolutionary or book-worthy, however… she packages it beautifully in a darling cover launched by the tres chic Veuve Cliquot marketing machine and her charm and graciousness have no doubt captivated audiences and journalists everywhere. I raise my glass to you Mme. Guiliano. Cheers! I am on my way to L.A. 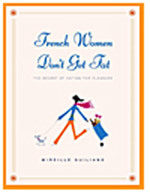 I have two questions for you: 1. does this book mention cigarette smoking as the number one appetite suppressant of French women?, and 2. How many copies of this book would you like for me to bring to you? Great critique. Thanks for pointing out some of the complexities that Mme. Guiliano conveniently left out of her book. That was better than the NYT reviews. Well done! For a single 24-year old living in a small East Coast city (which I am), this book makes perfect sense, because I CAN walk to work and the market (and I do), and I have no children to care for or house to maintain. For every other American not living this lifestyle, this book's suggestions are not only impractical, they're downright impossible. Ask a young mother to walk her kids to Walmart, and see how fast you get called crazy. If for no other reason, though, I will buy this book out of respect for Mme. Guiliano. She found a way to sell what doctors and nutritionists have been telling us since the beginning of time, and she's making another fortune for herself in doing it. If I happen to lose a few pounds while padding her wallet, I'll call myself happily scammed. Hi Laura! Whew...you sound pretty worked up about this book (or about how its been received in the US)! I'm not really familiar with it (I saw one other blog that mentioned it, but that's all), but really enjoyed your post - what you say makes alot of sense. I think books like this appeal to our sense of fantasy as much as anything (sort of like Martha Stewart) - its more about reading (or just thinking about reading) the book then actually doing something to change your life. bulls-eye! if we Americans weren't the Americans that we are, great inventions would have ceased to exist... such as? the dishwasher, the microwave oven, the gas range, the washer-dryer... i could go on. if not for our quest to do things more simply and in great speeds, we'd still be doing everything by hand. and that, of course, would mean we'd be thinner. and we'd probably stay in the dark ages, too. I have not yet finished this book and don't think I will. It is clearly a plug for Veuve Cliquot as drinking champagne is suggested on almost every other page. Also, Ms G doesn't mention that zillions of French women smoke, well into old age, which may contribute to their desire to eat only when necessary. Finally, does Ms G ever ask the question why McDo is popping up everywhere in France, and thriving? It's because the French like it. That is the one thing that stuck out to me when I spent a year studying in France in the early nineties, not only are the French eagar to poo-poo American culture, they are also eagar to consume it. hey!!! i am a fat french chick and tell that author of yours that her book is not funny! @ argh! I absolutely love the updates on this site. I miss Paris a lot and wanted to come for spring break but totally need to save up money to do that again! Maybe i will visit after graduation in JUNE!!!! Anyhow, just wanted to let you know that i miss you and miss the times that i had while living in France (darn, i miss the food too...tarte au poivre, pomme, et pistache! ).